Glen R. Graham, Attorney At Law, in Tulsa, Oklahoma, provides DUI defense for anyone charged with drinking behind the wheel. There is a multitude of possible defenses and angles to attack the state's evidence, and we explain all of the options to you. Protect your rights by calling on the best attorney for traffic offenses in Tulsa, OK. If you’ve been arrested for drinking while under the influence, you need representation from someone who has experience in these types of cases. Glen R. Graham, Attorney At Law, is the ideal DUI legal representative for you. Our firm is dedicated to fighting for your rights. We go above and beyond to achieve satisfactory results. Your victory over DUI arrests is our top priority, because when you win, so do we. With our knowledge of the law on your side, you can feel confident that you have the most qualified attorneys. Warning: If you are charged or arrested for a DUI or APC or drunk driving offense in Oklahoma, you only have 15 days from the date of your arrest to take certain important action to save your drivers license and to request a hearing on your license. You should contact an attorney immediately. Most importantly, you only have 15 days from the date of your arrest to request a hearing on your driver's license and if you fail to do so, then you waive your right to a hearing. This is an opportunity for us to ask the officer questions and determine any strengths or weaknesses in the case. In addition, you can receive a temporary driver's license by requesting a hearing if you had a driver's license when you were stopped. The Graham Law Firm represents all types of traffic tickets and arrests to fight the tickets or trials or negotiate plea deals which protect your driving record and your insurance costs. We also represent clients arrested for dui, dwi, driving under the influence of alcohol or drugs, driving while impaired, reckless driving, aggravated speeding, hit and run, speeding tickets, and other criminal offenses. 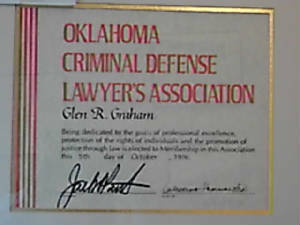 The Graham Law Firm has criminal defense attorneys and traffic defense lawyers for representation in Oklahoma district courts (county courts) and Oklahoma municipal courts (city courts), including Tulsa, Broken Arrow, Bixby, Glenpool, Owasso, Sand Springs, Sapulpa, and surrounding courts in Oklahoma. Also, the Graham Law Office travels to surrounding areas and county courts: Tulsa County, Rogers, Creek County, Nowata, Osage County, Pawnee County, Cherokee County, Wagoner County, and others. If you receive traffic ticket for a reportable offense and if you are convicted, it may be reported to the Oklahoma Department of Public Safety and it may add points to your driving record causing a possible increase in the costs of your insurance for years to come. Also, if you accumulate too many points, then your driver’s license may be suspended. Often, it may be possible to hire the Graham Law Office to negotiate a plea bargain to obtain a reduction to a lesser offense that does not get reported to the Department of Public Safety and does not get added onto your driving record. Additionally, it may be possible to hire the Graham Law Office to assist you in obtaining a work permit or modified driver’s license if you license has been suspended. In certain cases, you may need the assistance of an attorney to obtain a re-instatement of your driver’s license. Most can be located here. The Glen R. Graham Law Firm represents persons charged with crimes in Oklahoma. If you would like a consultation with an attorney from the Graham Law Office please call (918) 583-4621 The Graham Law Office travels to Tulsa, Bixby, Broken Arrow, Glenpool, Owasso, Sand Springs, Sapulpa, Tahlequah, Oklahoma. Also, criminal attorney law firm covering surrounding areas and county courts: Tulsa, Rogers, Creek County, Nowata, Osage County, Pawnee County, Payne County, Cherokee County, Wagoner County, others. Contact us today to make an appointment to thoroughly discuss all of the facts in person. Place your trust in our experienced attorneys, and we’ll provide you with comprehensive legal advice on how you should proceed. In the event of a DUI or DWI arrest, contacting a lawyer is your top priority. When you recruit us, we’ll work closely with you to determine the best way to approach your case. You don’t have to face the situation alone when you have DWI legal representation. Our experience and skill in the courtroom allow us to confidently stand by your side when you need us most. We’ll guide you through the complicated process of fighting against a DUI or DWI arrest. Contact us to schedule a consultation with the best attorney for traffic offenses. We proudly serve clients in Tulsa, Oklahoma, and the surrounding areas.